PLOT: When 11 year old Riley is taken from her happy Midwest life and moved to San Francisco, her emotions – Joy, Sadness, Fear, Disgust and Anger – must try to deal with her new environment and the challenges it brings them. In the 20 years since its first film was released, Pixar Animation Studios has taken us on wonderful journeys with talking toys, scream-collecting monsters, culinary rodents, a floating house and much more. This time around however, the story took us somewhere many of us never knew we wanted to see – inside the head of an 11 year old girl! The girl in question is Riley, a fun-loving and popular child from Minnesota, whose world is turned upside down when she and her parents move to San Francisco. As you might imagine, this results in her emotions being mixed up, but the twist is that in this film, her emotions are literal characters inside her head, working together to control her mind. It is established early in the film that every person has a team of five characters controlling their emotions– Joy, Sadness, Fear, Disgust and Anger – and the way they interact with the control panel in the mind’s headquarters determines how their person behaves in real life. The key figures in Riley’s mind are Joy (Amy Poehler) and Sadness (Phyllis Smith) who, at opposite ends of the emotional spectrum, struggle to get along with one another. When one of their squabbles results in them accidentally being sent into the recesses of Riley’s mind along with all of her long-term memories, they must work together to restore her emotional balance before the real-world impact becomes irreparable. 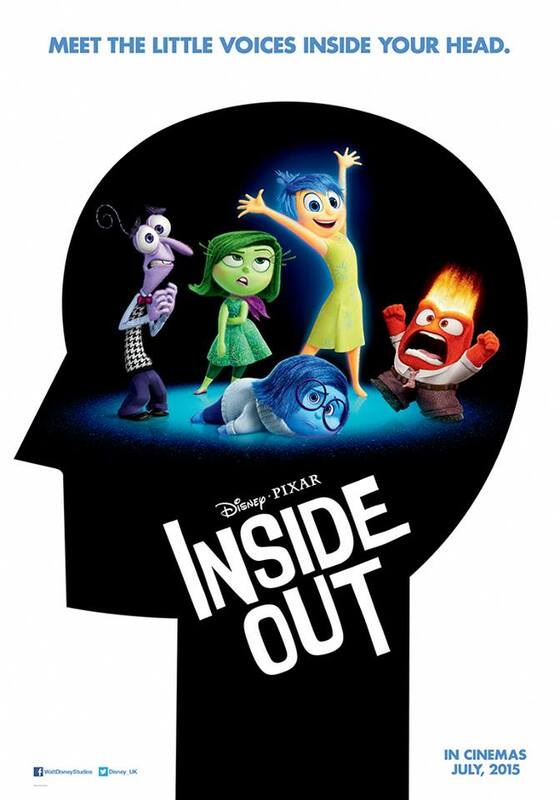 It should come as no surprise to find that the director and co-writer of Inside Out is Pete Docter, who trod similar conceptual ground with his first Pixar production, Monsters Inc. In that film, a workforce of quirky characters harnessed the screams of young children to provide power to their world, and the themes of controlling human emotion and the daily working grind are core to his latest offering. Joy and Sadness observe the Islands of Personality from Long-term Memory. The visualisation of a working environment based in a person’s mind has been meticulously realised, with almost every aspect of human psychology turned into an often laborious workplace task. For example, any memories Riley forms are encapsulated as glowing orbs and sent down to Long-term Memory, a vast, warehouse-like storage area. In that zone, a crew works to determine if older, fading memories are still useful, and discards those that are not. For instance, they review a set of memories about US Presidents and decide that only Washington, Lincoln and ‘the fat one’ are worth remembering, sending the remainder to the Memory Dump. There’s also a hilarious explanation of why certain musical jingles suddenly pop back into your head unexpectedly. Other areas include the Islands of Personality, Imaginationland and Dream Production, portrayed as a movie studio where nightly performances are projected into Riley’s mind as she sleeps. These locations are negotiated during the film by Joy and Sadness, who are joined by Riley’s long-forgotten imaginary friend Bing-Bong. The level of detail and thought that has gone into this world is simply phenomenal, and a testament to the creativity that exists at Pixar. While Joy and Sadness strive to get back to headquarters, their colleagues are desperately trying to steady the ship, but with the only emotions available being Disgust, Anger and Fear, the impact on Riley is dramatic. The previously happy girl becomes withdrawn, argumentative and ultimately falls out with her parents, and a decision made by her mind controllers results in her running away from home. Of course, we as the viewers understand why this is happening but if you look at it from the outside, this is a completely understandable reaction from a girl that has been taken away from her happy home to a lonely, scary new place. It is from this situation and the ultimate resolution of the story that the film’s strongest message comes – you can’t be happy all the time, anxiety and depression are difficult to understand or explain, and sometimes sadness is as powerful and important an emotion as happiness. It’s a powerful message delivered in a child-friendly manner that has never really been done before, and that’s why this film stands out above the ordinary animated films that are churned out every year. Riley’s troubles are honest reflections of real-life issues that can affect childrens emotions. 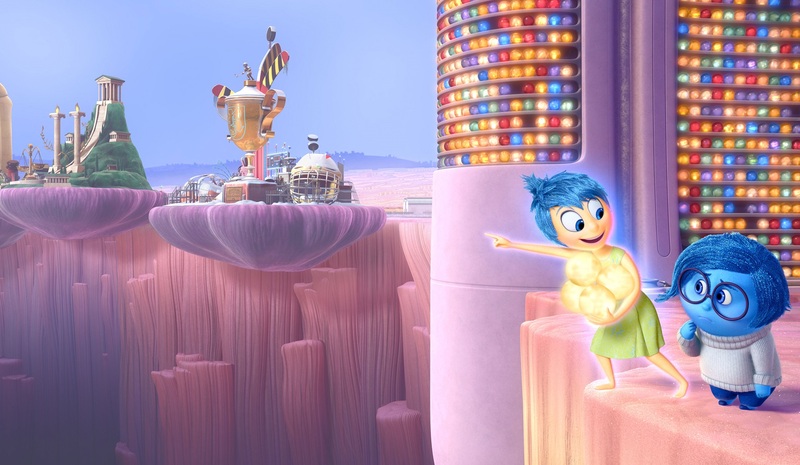 The majority of Pixar films are intended to work on two levels – one for kids and one for adults – and while Inside Out is no exception, I strongly believe that it is their first movie that is more suitable for adults than children. Naturally there is a simple adventure story with colourful characters for the youngsters, but there are concepts here that are way beyond what most children will understand, most notably the Abstract Thought room and jokes about Déjà vu and Fact versus Opinion. Some of the characters are also more complex than in a regular kids movie. Joy is a perpetually optimistic character, a personality that Poehler had already honed to perfection in Parks and Recreation, but the more interesting character is Sadness. 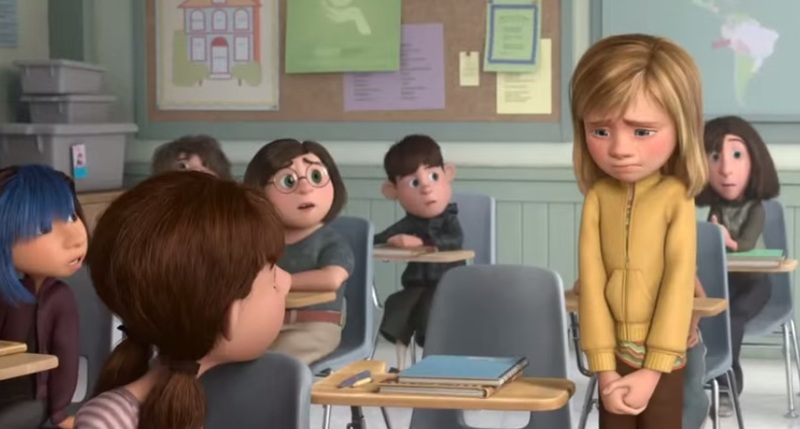 Smith portrays her as an embodiment of hopelessness that is simply unable to be happy, but as the film progresses the lighter side of her personality begins to shine through. While I haven’t suffered from it myself, I imagine this is a close an illustration of what depression is like as can reasonably be achieved, and watching the character is quite distressing at times. While the film is generally brilliant, there are a few niggles. The real-world story of Riley often plays second fiddle to what is going on inside her head, to the point where you almost forget the bigger picture. There are moments that are too blatantly trying to tug on the heart-strings, particularly the fate of Bing-Bong, and the resolution of the story feels a bit rushed. Overall though this is a wonderful film, packed with creativity and humour, with a strong story and a worthwhile message. Despite all of this it is still only my third favourite Pixar movie, but undisputedly the company’s most intelligent to date and one of the best films of 2015. Finally, I want to mention the short film that customarily preceded Inside Out in cinemas, and is included as an extra feature on the home release. Lava is the tale of a volcano that is slowly going extinct whilst hoping to find somebody to love, with the story being told musically as a tropical lullaby. The directorial debut of Pixar’s head of animation James Ford Murphy, it is one of the saddest, most beautiful shorts I can remember, and yet another reminder of the talent that exists amongst the company’s crew. Pixar’s most intelligent and thought-provoking movie to date, packed with creativity and humour, and arguably a better film for adults than it is for kids.